You can listen to more voices at the NextUp Nuance Sample page, but even that contains only a fraction of what is listed in Lion’s new Speech preferences. As you can hear, they are significantly improved from the current voices in Mac OS X text-to-speech, some of which are comically drone-like (Cellos anyone?). The new voices exist as downloadable content in developer preview 3 of Lion, and were originally discovered by NetPuting and brought to light by 9to5mac (screenshot source). 9to5Mac mentions that each voice independently costs $45, suggesting Apple has reached an agreement with Nuance to license the voice technology, and they also suggest that these voices and text-to-speech technology will be a component of iOS 5. I’ll go ahead and remind everyone that until Lion ships this summer, we don’t know for 100% certainty that these voices will be included in Mac OS X, but the evidence certainly points that way. 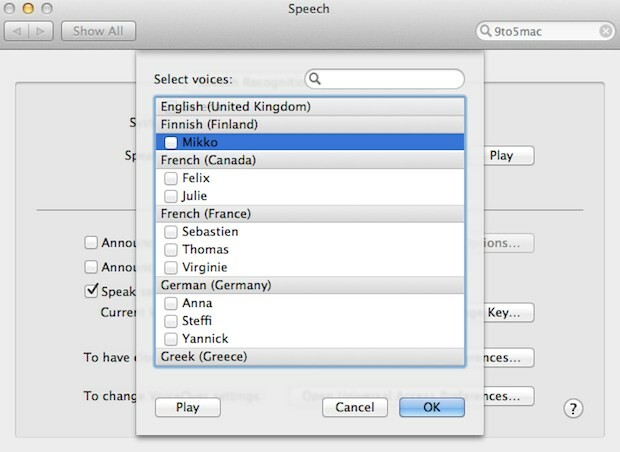 I’ll bet that these accented voices start making appearances in games on both iOS and Mac OS, what do you think? I still find them disappointing. What do you think of ivona? Do they sound slightly better? Agree. I really like the Ivona voices. My fav is Amy. I’ve been looking but I can’t see a way to get it for mac. Same… If anyone can find a way to get Ivona voices on osx let me know! Amy’s also my favourite Greg, I was about to get her for android and Amy’s voice is so much easier to listen to when going threw my university text books then Alex’s… Which is what I’ve been using for school since I believe 2008..
It’s nice that they finally have this feature. But for the record, I’d like to say that Google Android phones had this feature for a while. Proof that Android doesn’t copy everything Apple iPhones do. Um… when did they not have this feature? Apple has had this feature before Smart phones were even invented. @GB’s Tech News – OSX Lion is the Mac operating system, not the iPhone. And both iPhone’s iOS and Mac’s OSX already have this feature too. These are just new voices added to 24 voices already available on OSX. I wonder if such nice sounding voices are available out there, why does the Emergency Broadcast System’s voice still sound like Speak ‘n Spell toy from the 1980s? Ha ha! Well, Finnish is quite… Uhm… Bad as… you know. I agree, it was totally garbage. Pronunciation-wise, all languages are good (at least the ones I speak). The problem is that many of the languages suffers from “stuttering” and incorrect intonation (especially Italian and Japanese) at various levels. Anyway, being only 1MB each one cannot complain too much. The Finnish sample is seriously broken. It sounds like a poor walkie talkie connection. Almost all words are missing parts of them. I wonder if you can use Ivona voices on a Mac. Nuance voices are average, at best. Mac voice Alex is better than the others you download. What’s interesting is that the Tom voice in Mac OS X Lion is the same voice that’s used in NOAA’s All Hazards Weather Radio. It does make sense there. I mean NOAA also has a contract with Nuance (The owner of SpeechWorks). Read4Me reads Microsoft Word documents, Rich Text, HTML, Open Office, and many other types of text files. It pronounces the text in a choice of voices and you can adjust the speed, pitch and other properties. You can create a soundtrack with dialogs in multiple voices, saving to audio file or AudioBook format. I cannot understand “Mikko” at all. And I’m a native Finnish speaker. Hmm… come think of it, maybe that’s the problem. At least the umlaut-a:s seem to be simply missing from the words. hard to tell if it’s the source text or poor sound synthesis. Wooow! I needed a text to speech software, but didnt know that it works right away in mac without any extra software. Thanks Paul!